Jax Overhead Door Repair Service provides complete garage door repair services. We install and repair all types and brands of garage doors. We replace or repair springs, cables, openers, tracks and rollers. We also install new garage doors. We provide no obligation over the phone quotes and same day service. We also provide 24/7 emergency garage door repair service. If your garage door is stuck open and can’t be closed or is stuck closed and can’t be opened with your car in the garage, that’s a garage door repair emergency. Call us at 904-685-1500. We always answer our phones. 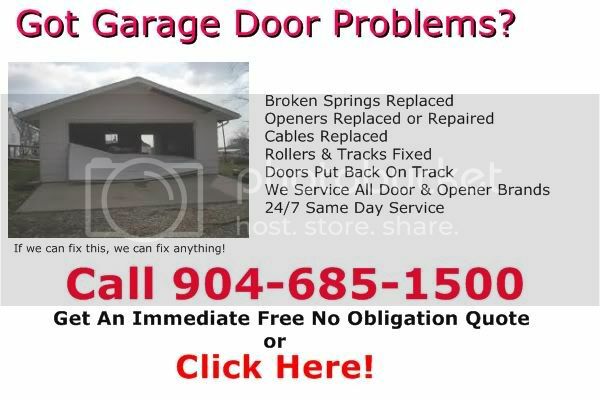 Your Green Cove Springs Hometown Garage Door Repair Experts.